Arnold & Son is revealing some Baselworld 2013 novelties already, like this Ultra-Thin Tourbillon Escapement timepiece. Or UTTE, as they call it at Arnold & Son in La Chaux-de-Fonds. They claim the UTTE to be the thinnest tourbillon wristwatch on the market with a case that’s only 8.34mm thick. The mechanical hand-wound movement caliber A&S8200 is only 2.97mm thick (or thin). 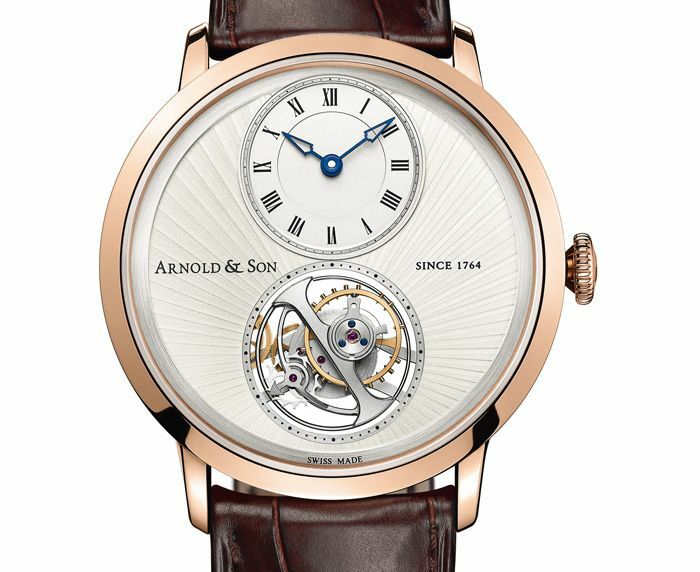 The tourbillon complication plays an important role in the history of Arnold & Son. John Arnold, founder of Arnold & Son and watchmaker who was born in 1736 in Cornwall, was very close to Abraham-Louis Breguet. The first tourbillon escapement that Breguet developed was used for John Arnold’s no.11 movement. This watch can be admired in the British Museum in London. Therefore, the Arnold & Son UTTE timepiece fits perfectly to the brand’s heritage. The thinnest tourbillon watch has been entirely developed in-house in the beautiful surroundings of La Chaux-de-Fonds, Switzerland. Not visible on the images in this article, but hopefully in the photos we can take during our Baselworld encounter with Arnold & Son this coming week, is the fact that the flying tourbillon cage is positioned on the same height as the hour and minute hand in the time indicator dial in the upper half of the UTTE’s dial. 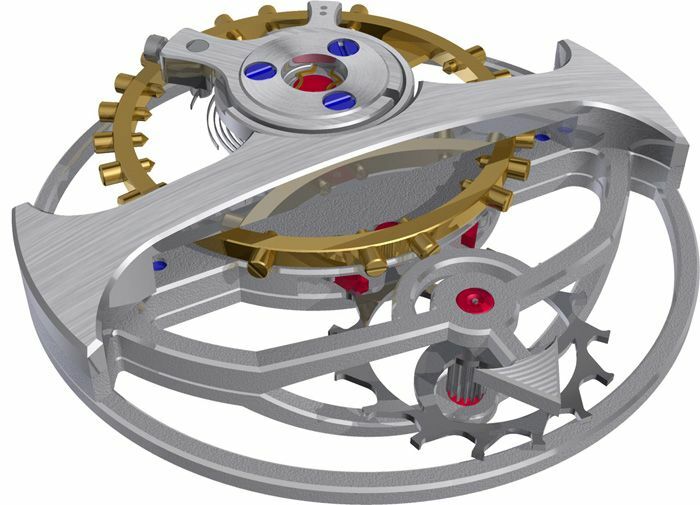 To achieve this, the flying tourbillon cage has been lifted a bit out of the movement. Besides the impressive technical aspects of the Arnold & Son UTTE timepiece, we feel it is also a stunning timepiece because of the sleek case design and beautiful silvery-white Côtes de Genève rayonnates dial. There are two versions of this UTTE timepiece; an 18 carat rose gold version as pictured above and a palladium case. Both versions of the UTTE have the same technical specifications but different dials and the movement also received a different treatment. The red gold UTTE has a rhodium treated movement and the palladium version has a grey(-ish) treatment. Arnold & Son calls it a NAC treatment, but we have to ask them in Baselworld what that exactly means. Arnold & Son gave the hand-wound movement caliber A&S8200 a real haute horlogerie treatment with its hand-engraved tourbillon bridge, chamfered bridges with polished edges, fine circular graining and Côtes de Geneve, blued screws with bevelled and mirror-polished heads. The tourbillon cage has a satin-finish with chamfered and polished edges. The movement is 32mm in diameter and perfectly fits into the 42mm watch case. The tourbillon cage alone is 14mm, making it very visible for the wearer of this piece. Because of the double barrel, this Arnold & Son Ultra-Thin Tourbillon Escapement watch has a power reserve of 80 hours. Quite useful for a hand-wound watch. More information can be found at www.arnoldandson.com and as promised, we will get back to you with more information on this manufacture from La Chaux-de-Fonds when we’re back from Baselworld. For live footage on the Baselworld exhibition, make sure to follow us on instagram (@fratellowatches or instagram.com/fratellowatches).